Add PDF capability to any website, Java, or Android application. Our Java PDF library products support a wide range of functions when it comes to creating, manipulating or converting PDF documents. VeryPDF Toolkit is our Android SDK that creates, displays and manipulates PDF documents. Integrate a PDF viewer into your website or Java application. Java PDF Components integrate into websites (as applets) or Java desktop applications to view, annotate, fill forms, digitally sign or edit PDF documents directly. Integrate a HTML Viewer to display SVG files that were converted from PDFs with high fidelity on the server-side, requiring no plugin on the client side. Work with PDFs on Windows, Mac OS X, and Linux on desktop, servers, and tablets. PDF Automation Server automates the receiving, processing, and routing of PDF documents. VeryPDF Android PDF SDK Toolkit is an Android Java SDK that allows app developers to quickly add PDF functionality to their Android apps. 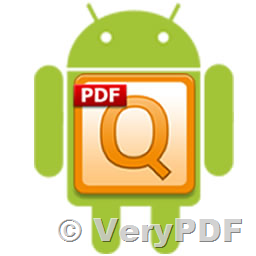 VeryPDF Android PDF SDK Toolkit provides a wide range of functions, it can be used by apps to create custom PDF documents and reports, to allow users to modify documents and to show PDF content to end users. Following our established tradition of 100% self-sustaining, portable PDF solutions, VeryPDF has developed this software so it can run on any Android device and can be integrated easily into any standard Android app. Edit document properties such as title, keywords, subject, creator, producer, etc. If you wish to purchase this Android PDF SDK product or require any additional information, don’t hesitate to contact us at http://support.verypdf.com ticket system. Custom-build version of PDF Automation Server - Create, Print, Annotate, Stamp, Optimize, Convert, Fill, Sign or Modify PDF files automatically on Windows and Linux Server Systems, without any user interaction. Everything can be done at background. This entry was posted in VeryPDF SDK & COM and tagged android pdf sdk, android pdf toolkit, java pdf, pdf android, pdf java, pdf toolkit. Bookmark the permalink.